We recently moved from Southern California to Lebanon Tennessee few months ago. We’re in process of building a new shop, I started a blog on here. So our 3rd car garage is semi set up as shop temporarily with alot of moving stuff around. Alot of things from shop are still packed. After meeting one of our neighbors son named Parker I had to do this. I was so impressed with this young man, his manors and smart. He’s turning the big 10! & addicted to checkers. So I figured why not. The smile on his face said it all, and so worth it. It was difficult being most of my stuff is still packed but I made do. It’s made out of curly maple and purple heart. The good thing is as he gets older he can use it for chess. I didn’t make the checkers, ran out of time so bought them on amazon. Only had 6 days until his birthday when I brainstormed this idea. Thx for looking Ya’ll, ,,,,, all comments welcome. Great story Ken! You are a good guy for doing that good deed! The young man will love this gift forever I’m sure because it’s magnificent! We lived in TN for 12 years and on my travels there I stayed in Lebanon Tennessee one night before I continued on to the Spring Hill Saturn Plant. It’s a beautiful state. Good luck with your new home! Very well done Ken just like all of your projects. Great way to get acquainted with the neighbors and I can imagine that boy will be wanting to learn some woodworking from you. That looks fantastic. Great job buddy. My daughter is in Cookeville TN and her Mr Man is from Lebanon TN. Nice Project & Well Done Ken! Good luck in your new place. I made a bunch of those boards for my grand kids and it warms my heart every time see them setting it up. I got my checkers from Rockler on one of their super-duper deals. I love making stuff that actually gets used. And who knows, maybe you’ll be playing more checkers “out on the porch” with some of your new neighbors. Gorgeous board, Ken. Did you mount the squares on a substrate? What a sweet fellow you are Ken! Great looking board too!! I hope you can find time between that hectic pace of shop building for a game or two with the young lad! Tony C Thx buddy great to chat with all you guys. GR8HUNTER, THX, I never see on phone, not sure he’s allowed yet. Charlie thx, hope all is well freind. Mike Thx hope he want to learn that would be great to mentor. Rick, thx were kinda close smile. Elaine, thx I hope so too super excited. Nice making a new friend of a young boy… I think he will be getting interested in Woodworking very soon… and you will be his Mentor! Great! 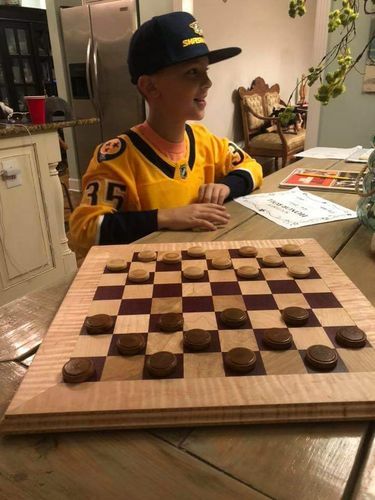 Beautiful checker board… Glad you have a little room to continue doing things!! Another project living up to your usual high quality use of techniques! His smile says it all, my new buddy.